The Vatican has released the Pope’s schedule for Holy Week and Easter. Just like every year, Pope Francis will celebrate the main ceremonies during these days. On Sunday 14 April 14, Palm Sunday, Pope Francis will celebrate Mass in St. Peter’s Square at 10.00am. He will begin by blessing the palms and olive branches at the obelisk in the center of the square. From there, he will continue with the procession to the altar accompanied by young people. For more than 30 years, Palm Sunday also marks World Youth Day in Rome. The Easter Triduum begins on 18 April, Holy Thursday, with Chrism Mass in St. Peter’s Basilica. In the afternoon, Pope Francis has chosen to go to a penitentiary center – the Velletri Prison – to celebrate the Mass of the Last Supper with rite of foot washing. He will wash the feet of 12 prisoners. On 19 April, Good Friday, Pope Francis will celebrate the Passion of the Lord and adoration of the cross at 5.00pm in St. Peter’s Basilica. Then he will go to the center of Rome, to pray the traditional Way of the Cross at the Colosseum. This year, the Pope has entrusted the meditations to a woman, Sr. Eugenia Bonetti, a Consolata missionary. She is president of the association “Slaves no more.” Since 2012, this organization combats all violence, discrimination and abuse against women. Therefore, these meditations will likely focus on human trafficking. At the end of the Way of the Cross, the pope will add some words and send the faithful forth with a blessing. On Saturday night, at 8:30pm, Pope Francis will celebrate the Easter Vigil in St. Peter’s Basilica. He will baptize several people who are being welcomed into the faith. Sunday April 21, Pope Francis will celebrate Easter Mass in St. Peter’s Square at 10.00am. At noon, he will impart the Urbi et Orbi blessing from the basilica’s central balcony. We have shared below some of the highlights of services for Holy Week and Easter. For full details on events in your diocese click on the relevant link here. Mass of Chrism on Wednesday 17 April at 7.00pm in Saint Patrick’s Cathedral, Armagh. Mass of Lords Supper on Holy Thursday at 7.00pm in Saint Patrick’s Cathedral, Armagh. Celebration of the Passion of Our Lord on Good Friday at 3.00pm in Saint Patrick’s Cathedral, Armagh. Easter Vigil on Holy Saturday at 9.00pm in Saint Patrick’s Cathedral, Armagh. Wednesday 17 April: Mass of Chrism with Bishop, priests and people of the Diocese at 7.30pm. All Holy Oils Blessed. Holy Thursday 18 April: Solemn Mass of the Lord’s Supper and Procession to the Altar of Repose 7.30pm. Archbishop Diarmuid Martin will led the Way of the Cross through the Phoenix Park on Good Friday 19 April. The procession will proceed from Wellington Monument at 12.00pm to the Papal Cross in the Phoenix Park. On Good Friday evening, April 19 Archbishop Diarmuid Martin and Archbishop Michael Jackson, Church of Ireland Archbishop of Dublin, will once again lead a silent walk through Dublin’s city streets carrying a cross from Christchurch Cathedral to St Mary’s Pro-Cathedral. This begins with a moment of prayer in Christchurch at 7.15pm after which the two Archbishops will quietly lead us through the city centre as they carry the cross of the ecumenical monastic community of Taizé across the Liffey to St Mary’s arriving around 8pm. Those who wish can stay in the Pro-Cathedral for a meditative Prayer around the Cross with the chants of Taizé which lasts approximately an hour. All are welcome. The Glasnevin Grouping of Parishes together with St. Mobhi Church of Ireland Parish are organizing an Ecumenical Way of the Cross on Good Friday, 19th April, beginning at 12.00 noon outside the Margaret Aylward Centre for Faith and Dialogue, Old Finglas Road and finishing in the forecourt of Our Lady of Dolours church, Glasnevin, followed by a solidarity lunch (proceeds towards flood victims in Mozambique and Malawi) in the parish centre. Enniskerry parish will proceed with their Ecumenical Way of Cross through the village on Good Friday, 19 April beginning at 11.00am in from St Mary’s Catholic Church to St Patricks, Church of Ireland. Led by Fr Bernard Kennedy, St Mary’s & Rev Cathy Hallisey, Rector Powerscourt with Kilbride. The Ecumenical Walk for Justice will take place at 9.30am Good Friday morning. The walk will start at the C.O.I. Rathfarnham, walking to Church of the Holy Spirit, Ballyroan & finishing at the Annunciation, Rathfarnham. Join Rathmines Parish on Good Friday, 19 April 2019, beginning at 12.30pm in the forecourt of the Mary Immaculate Refuge of Sinners Church, Rathmines and ending outside St. Finian’s Lutheran Church around 2.30pm. Good Friday night at 8.00pm we have our Stations of the Cross done with real people acting out the stations and beautiful thought provoking meditations being read. 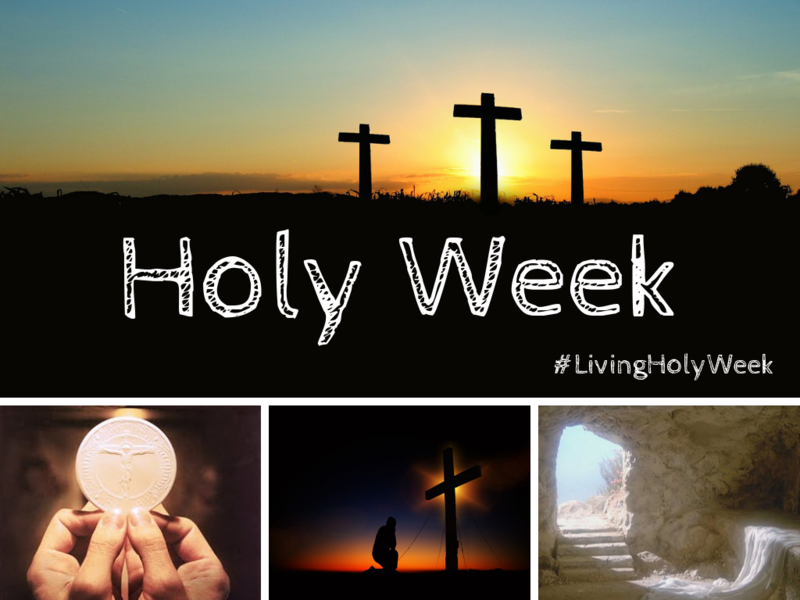 Click here for more on Holy Week and Easter services in the Archdiocese of Dublin. Click here for details of all the services taking place in parishes in the Diocese of Kerry. Monday 15 April: Mass of Chrism in St. Muredach’s Cathedral at 6.30pm. Celebrant is Bishop John Fleming, Bishop of Killala. St. Patrick’s Church @ 7.00pm with Celebrant Bishop John Fleming. St. Muredach’s Cathedral: Easter Vigil at 9.00pm with Celebrant Bishop John Fleming. Holy Thursday 18 April – Chrism Mass will be celebrated at 11.00am by Bishop McGuckian, SJ with the Priests and people of the Diocese. Mass of the Lord’s Supper on Thursday 18 April in St Eunan’s Cathedral, Letterkenny at 8pm. All of the above ceremonies will take place in the Cathedral of Sts Eunan and Columba, Letterkenny at which Bishop Alan McGuckian, SJ will be the main-celebrant. This section will be updated throughout Holy Week. 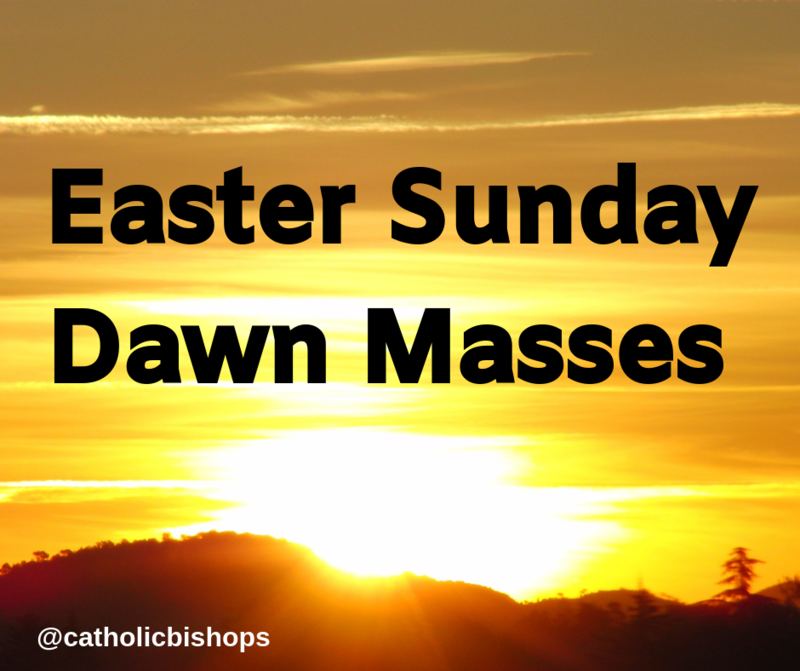 Please click here for a list of Dawn Masses taking place around Ireland on Easter Sunday. Each year, RTÉ Television broadcasts Easter Liturgies, sometimes from their own studios, sometimes from a Church around the world, and sometimes from a church in Ireland. This year, two of their Easter Broadcasts will come from the College Chapel in St. Patrick’s College in Maynooth, Co. Kildare. Both Liturgies will feature a rich array of music from the Christian Liturgical tradition, including newly-composed settings by Ó Riada, McDonagh, O’Leary and the choir’s director, Dr John O’Keeffe. “All across the country, and, indeed, the world during the Triduum days, there are musicians endeavouring to do justice to the great events that we gather to celebrate. Here in Maynooth, we try to build on the foundations of two major traditions, the rich heritage of chant and choral music that has grown up with the Church’s Liturgies down the centuries, and the cultural devotional musical and language aspects of our native tradition. Onto these each year, we try to graft on new musical elements, to help us grasp in a deeper way, the contemporary significance of the Christian story. The College Chapel in Maynooth was built between 1875 and 1891 and was designed with the theme “Laus Deo” (Praise God) in mind. Everything in the Chapel points heavenwards, the arches, the ceiling, the windows and the finials; all keeping with the neo-Gothic design and it’s theme. It is the primary Church for ordinations from Maynooth, and since it’s foundation, over 11,000 priests have ministered in all corners of Ireland, and most parts of the globe. The College has undergone refurbishment over the years and most recently, saw it’s beautiful organ restored by Firm Fratelli Ruffatti of Padua, in Italy. This year is a special year for close neighbours of St. Patrick’s College, Kairos Communications, who will be producing and broadcasting the two ceremonies for RTÉ. Although the company was founded over 40 years ago, this is their 20th year of working with both RTÉ and local parishes around the country to help broadcast Sunday Worship and Religious Ceremonies. Having worked closely with the College on other projects over the years, including the first Mass of the new Millennium in January 2000, they are looking forward to returning to the beautiful College Chapel to help broadcast and celebrate this most wondrous time in the Church’s year – the Resurrection of the Lord and the return of the Light of Christ. Easter Vigil Mass (RTÉ One Television and RTÉ Radio 1 Extra from 11.00pm to 12.40am.